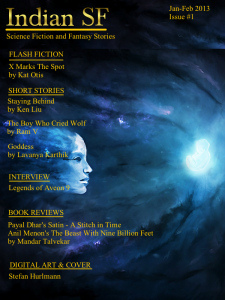 With Indian SF, a new online magazine, we have a promising new conduit for the spread of science fiction and fantasy from India. The first issue, available for free download, contains a small but pleasing selection of Western and Indian stories, as well as an interview with a prominent Indian comic-book team and a pair of reviews of Indian genre novels. Its creator, Geetanjali Dighe, is a digital marketer and science fiction fan based in Mumbai, who hopes to showcase the Indian writers she loves and expose them to the wider world. Despite a few rough edges in the editing, and half of the stories not being Indian in origin, this is a very promising start to a new publication. Science fiction and fantasy literature, as we know it in the Western world, seems so thoroughly a product of European culture that it can be hard to imagine how it could be different. The development of the Western fantasy tradition is well-known, from its roots in Celtic, Frankish and Germanic mythology, through medieval epics such as Beowulf, to tales of chivalric romance such as the Arthurian legends, and finally to the Gothic novel that inspired horror, modern fantasy, and (with the addition of scientific and industrial elements) an entirely new genre, science fiction. To Western SF/F fans, this progression seems natural and inevitable. But we often forget that other cultures have their own rich folklore and mythologies, which have led them to develop rather different traditions of fantastic literature. Thankfully, the Internet now makes it possible for those who wish to leave the beaten path to discover rich new veins of fantasy little-seen by Western eyes. India, in particular, is emerging as a source of strange and wonderful stories based in its own ancient traditions. Hindu mythology has inspired Indians for millennia with its enormous pantheon of deities and spirits, while the huge diversity of cultures in the subcontinent has allowed for a dense cross-fertilization of literary elements, and even homegrown science fiction traditions in regions such as Bengal. With the growing popularity of Bollywood movies and Virgin comic books in the West, Hindu mythic elements—and the literature based on them—have begun to spread into the global culture. Indian SF is meant to assist this spread by drawing attention to the richness of fantasy and science fiction from the subcontinent. In this first issue, the stories are a mix of previously published work by Western and Indian authors, along with one piece from an author little-known outside of India. The first story, ‘X Marks The Spot’, is a flash-fiction piece by Virginia writer Kat Otis, who has been published in Orson Scott Card's Intergalactic Medicine Show and elsewhere. Its thousand words depict an unsettling variation on the idea of a treasure map; in this case, the map serves not so much as a guide but as an oracle. Second is ‘Staying Behind’, by the well-known Chinese-American writer Ken Liu; this is a compelling post-Singularity tale focusing on those who have rejected their chance at immortality—or the afterlife, depending on your point of view. Next up is ‘The Boy Who Cried Wolf’, by Ram V, which appears to be original to this collection; the author writes a comic-book series and has published short fiction and nonfiction in Spark. This story is a magical-realist take on the classic parable, in which the wolves are far more than mindless predators. This story is a bit rough around the edges, particularly in its grammar, which seems slightly odd to a reader used to American English; but it reflects a deeply Indian, nearly animist, sensibility about the spirits inhabiting the forests of the imagination. The final tale, ‘Goddess’ by the Indian comic-book writer Lavanya Karthik, concerns a horribly deformed protagonist who, on the one hand, is isolated and exploited as too many such people are, and on the other hand, is caught up in the Hindu tendency to see deformity as a sign of divinity. Karthik takes this tension and uses it to construct a terrifying fable. This is a very strong story with fascinating Indian mythological elements, from a writer who deserves close attention. The remaining material provides a stimulating look at the Indian fantasy and science fiction scenes from several angles. An interview with the team behind a popular SF comic series, The Legends of Aveon 9, gives an Indian take on the process of adapting classic literature into a new medium. And two detailed, highly personal reviews of Indian SF/F novels give an enlightening glimpse of what Indian readers expect in their genre fiction. As well as being a new market for Indian readers and writers, Indian SF shows tremendous promise as a vehicle for Western SF and fantasy readers to see how their familiar tropes play out in the context of a different culture. It is clearly a first effort, and there is room for improvement. More focus on homegrown Indian fiction would be welcome, and undoubtedly this will come in time; more attention might also be paid to editing the interviews and reviews. But Geetanjali Dighe should be quite proud of what she has accomplished here. Indian SF is a wonderful peek into a new and exciting scene, and I, for one, will be looking forward to seeing how it grows and matures in future issues.